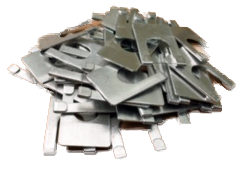 accesories via our EOU on-line store including exta test clips and test media etc. Domestic US shipping is always free from EOU and orders ship same or next business day. 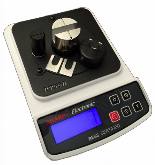 If you wish to order only consumables and/or accessory items then please place your order with sharpeningsupplies.com by clicking on their logo next to the product. Just click on the Sharpening Supplies logo next to the consumable or accessory you would like to purchase and you'll be transported directly to their page that supports that particular product. If you have any problems or questions ordering any product then just drop us a line at edgeonup@gmail.com and we'll make certain that your product needs are fulfilled quickly. NEW! ATF-10G - Aluminum Test Fixture Spares come in handy if you have a lot of edges to test. 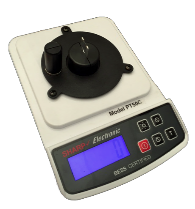 Compatible with all PT50 Series testers and ID75A testers. The Gold Standard. BESS CERTIFIED test media re-fill canister holds enough test media for 325 measurements. 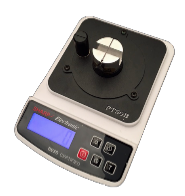 Use with all instruments that utilize the ATF10 and now ATF-10G test fixture. 100 piece bulk pack of disposable test clips. 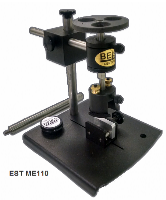 Works in conjunction with our DCB10 clip base and all electronic edge testers. Test clips are not currently BESS Certified. International and Industrial Customers - Contact us first via e-mail and after we have answered your product questions satisfactorily we will provide you with a pro forma invoice via e-mail that includes Air Freight delivery charges. If you agree to the terms of the pro forma invoice we will e-mail you a PCI compliant credit card invoice form that matches the total of your pro forma invoice in US dollars. Enter your name, card information (Amex, Visa, Master card, Discover), postal (zip) code in the invoice form we send and press the "remit key". That's all there is to it! While your funds will be remitted to Edge On Up your card details will not but rather to our PCI compliant card processor. We can also take credit card information over the telephone if that is more convenient for you. inside the domestic US when you order direct from Edge On Up. On this page,just click on the EOU ecommerce logo where all of our products are listed. inserts. The new wider slot accomodates wider edges more easily. 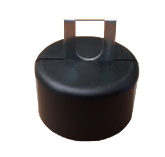 (1) silicon insert is installed and (2) cork inserts are provided.